Santoni shoes are a unique collection of shoe products produced by master shoemakers, passionately devoted to their craft. From the manual cutting of the leather, hand stitching of the shoe body, and the use of only the finest leathers and materials for all parts of the shoe including the insole, the end product Santoni mens shoe, is of a level of quality Italy has become famous for. No short cuts, only the best shoe possible comes out of their factories, shoe made to last. 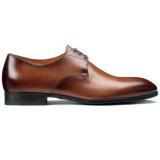 Refined, creative, uncompromised quality and excellence ; these are the hallmarks of the Santoni shoes brand. As seasons come and go and trends and styles evolve, Santoni's committment to the masterful shoe making process, utilizing techniques that combine old world shoemaking and modern technology in a beautifuly synchronicity, remain unchanged and inspired. Santoni shoes represent the best in quality, craftsmanship, pursuit of perfection and creativity. These are the elements that, even in the presence of unending stylistic change, have transformed this craft into an art form. 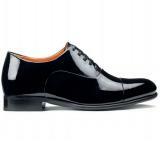 Shapes, structures, processes, techniques that arise not only from the experience and an innate aptitude at elegance, but a true culture of the shoe that began with the male shoe cobbler connoisseur, has been extended to women, children and accessories. Unique even among luxury men's shoe manufacturers is the color application process to their handmade shoes. 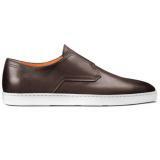 Each shoe has it's color manually applied in multiple layers. This painstaking and time consuming process results in shoes that are completely unique, no two shoes are ever exactly the same. The character provided to each and every shoe as a result of this process gives the owner a great sense of satisfaction, knowing that the shoe they are wearing is a 'one off' in a sense. 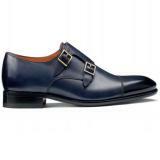 Santoni uses several construction methods for those shoes, which include the Blake stitch, Goodywear construction, Bologna construction, Tubular construction, and the Bentivegna construction. 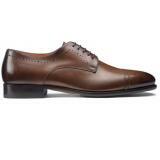 Each provides a unique set of benefits and comfort factors that are appropriate for each particular shoe style and its intended function. 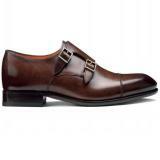 In the marketplace, similar Italian brands include Moreschi, Stemar, and Bruno Magli, but there's no mistaking Santoni from the rest. 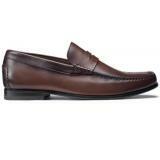 A hallmark of the brand are their beautiful dress loafers which are unsurpassed in quality and comfort. Men who wear Santoni wear it for life. Nothing seems to stack up when you've worn the best. 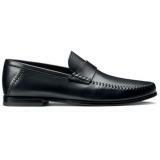 Santoni Toft - A refreshing comfort moccasin from Santoni, perfect for those long drives, or long walks. 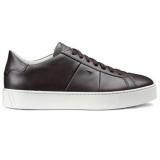 Features perforated Italian calfskin leather that breathes, bow tie detailing, contrast color stitching and moc toe design, and a comfort rubber driving sole and heel guard. 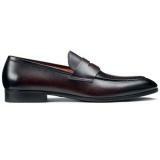 Enjoy your Sunday drives in a fresh new way this season with Santoni's Toft loafers. 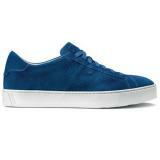 Available in Brown and Blue. Santoni Tanton - A striking casual driving loafer features a Santoni signature, hand antiqued finish in an absolutely beautiful Red. 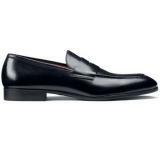 Penny loafer design with moc toe constructions and fine stitch detailing, fashionable heel guard, and rubber driving comfort sole will make this a definite 'go to' shoe this season. Wear it all day in comfort, and get lots of looks, in this beauty. Nappa calfskin is a very supple leather that requires extra special care. 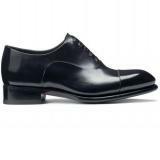 First, apply a shoe cleaner or conditioner to remove all foreign residue and return the shoe's natural durability and softness. 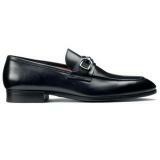 Apply shoe cream or polish. 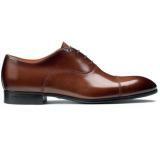 To maintain the shoe's maximum luster make sure the cream/polish is a close match in color to the shoe leather color. Allow shoe to air dry. Remove the excess polish and wax by brushing your shoes with a horse hair brush and then buff to finish. When you first get your new burnished calfskin shoes you may notice a slight haze over the leather of the shoe. 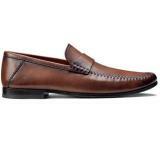 Wipe the shoes down with a soft cloth or brush with a horse hair brush. 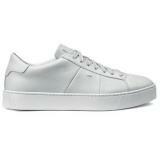 Clean these shoes regularly with a damp cloth and air dry. Using a soft cloth, apply a medium coating of shoe polish in a similar / matching color to your shoe leather and allow that to air dry. 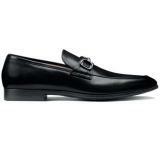 Brush down shoes with horse hair brush to remove excess polish and buff shoes using a soft flannel cloth. 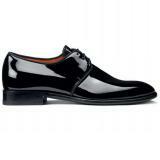 Patent leather shoes require treatment of mild soap and water first, to remove any foreign residue. Then buff to a shine using a soft flannel cloth. Lastly apply edge dressing.